Corporate Gifts — Allegory Handcrafted Goods Co. If you’re tired of giving clients, team members, and donors gifts that are quickly forgotten, you’ve come to the right place. When the worlds leading brands need a stakeholder gift that makes an impact, they call us. Client/Team/Donor/Stakeholder gifts from promotional giveaways to luxury executive gifts. Small batch custom products given to high-profile celebrity influencers. Awards packages for event honorees including well known politicians, athletes, and other public figures. Custom white label product collaborations with well-known brands. Standard packages from 5-5000 units. Options from $25-$1500 per unit. Delivery time as little as two weeks. Choose from our most popular options, or partner with us to develop a custom piece. 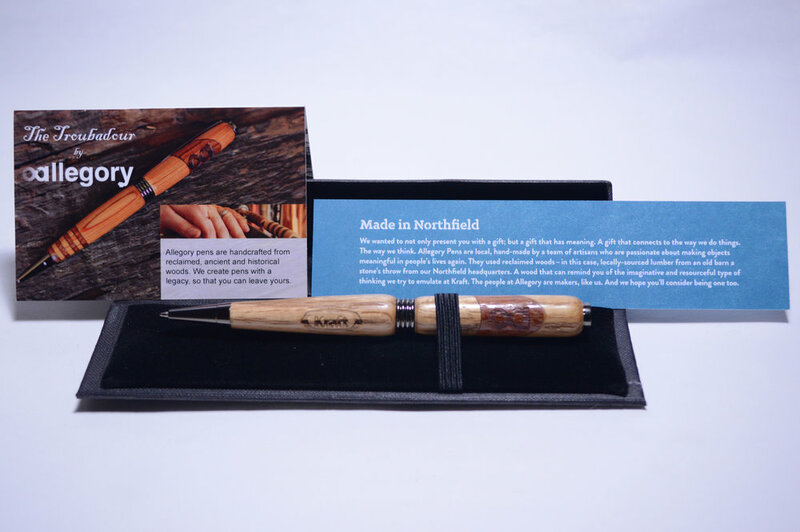 When Kraft foods wanted to court a class of MBA students for it’s leadership program, we created a custom version of our Troubadour pen. We sourced wood from a barn not far from their headquarters, built around the same time Kraft was founded. We were able to capture the rich history of their brand, and encourage the recruits to help them write the next chapter. We love diving deep into a brands history and values, and finding ways to communicate that powerfully through the perfect gift. Schedule a 15 minute strategy session with our founder to create an amazing gift experience together.